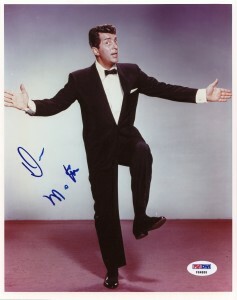 Between 1949 and 1956, Dean Martin made 16 films as the singing straight man to his comedy partner Jerry Lewis; the two were one of the hottest entertainment acts of the era. 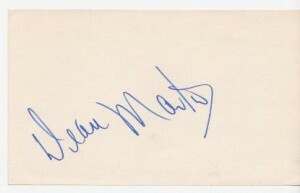 After their bitter (and much-publicized) breakup, Martin continued making movies, including both comedy and dramatic roles and the spoofy Matt Helm spy movies of the 1960s. A nightclub singer and solid member of Frank Sinatra‘s “rat pack,” Martin also had hit records, most notably “That’s Amore” and “Everybody Loves Somebody.” Martin’s easygoing attitude helped make him a hit on television, where he hosted a comedy and variety show from 1965-74. 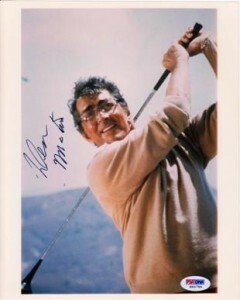 Though best known for the 51 films he made, Dean Martin was a prizefighter, steel mill laborer, gas station attendant and card shark before seeing the first glimmer of fame. It came when he teamed up with comedian Jerry Lewis in 1946. The duo were to become one of Hollywood’s truly great teams. They lasted 11 years together, and starred in 16 movies. They were unstoppable, but personality conflicts broke up the team. Even without Lewis, Martin was a true superstar. One of his best remembered films is in Ocean’s Eleven 1960 in which he played Sam Harmon alongside the other members of the legendary Rat Pack: Frank Sinatra, Sammy Davis Jr. Joey Bishop and Peter Lawford!